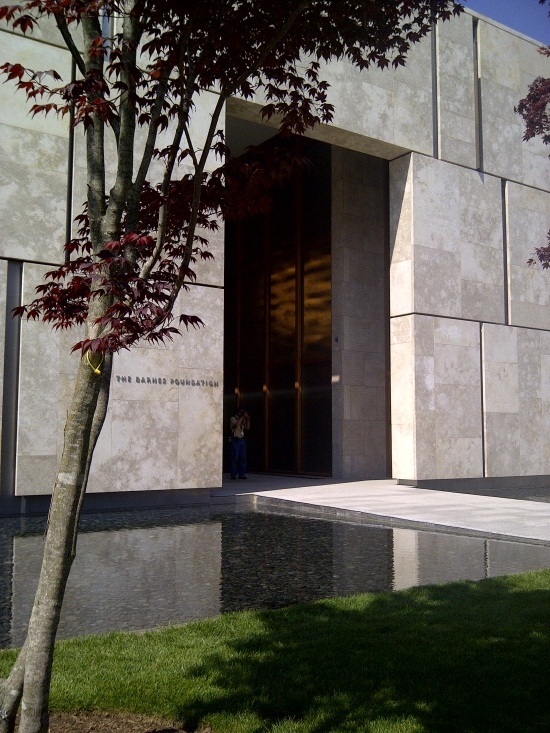 I don't mean to be critical, because I think everything was done to ensure that the Barnes Foundation in its new location would be perfect in every way. But, there were things that disquieted me that I would be remiss to not mention. The greatest being the absence of Dr. Albert C Barnes’ name anywhere in the building, except for its being on a small strip of metal on the ground that lines the reflecting pool inside of the entry alcove of the building. The strip is about 2 inches thick and includes a quote by Dr. Barnes and his name. That's it. There is no bust, no plaque, no image of Dr. Albert C Barnes. I was told that once the changing exhibition is taken down, the de Chirico portrait of Albert Barnes would be moved into the entrance hall. That exhibition will be in place for 10 months. But what would have been wrong with including some permanent memorialization of the founder of this great institution? There was a glaring omission that makes me cross. It has to do with Dr. Albert Barnes’ views about African art and its place in understanding classic aesthetic elements. 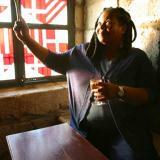 Dr. Barnes wrote passionately about the importance of African art to the development of European painting. We’re not talking about African art and modernism. Barnes said that were it not for the arts of Africa, the art of Europe would have died in the 15th century. He made his views apparent in the original building in Merion. On either side of the entrance to the building were ceramic re-creations by the Enfield pottery works of African masks from the Barnes’ collection. It was the only place in this country where you entered a major collection of European and American art through an African aesthetic lens. Derek Gilman assured me that African masks were being etched into the metal doors, but were not yet ready. But there was more. Along the inside of the main gallery room in Merion, Barnes installed a frieze, with African masks every five feet. When Henri Matisse delivered La Danse, he insisted that Dr. Barnes take down the frieze because he said it distracted from his mural. Dr. Barnes refused. 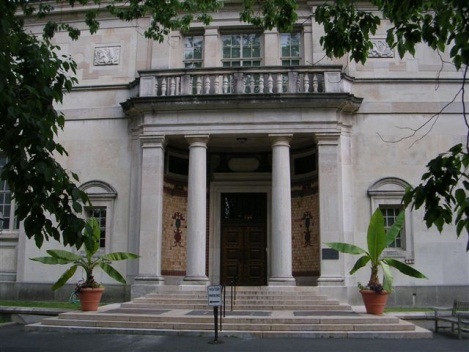 The design complemented the iron railings inside and outside of the Barnes gallery building that included an African mask in the center below a Grecian urn, flanked by classical scroll designs. Dr. Barnes was making an important statement. He was saying to his audience that African aesthetic belonged on the same plane, and was as important as Greek and Roman classical design. These elements are missing from the new building. During the evening of the second gala, I asked several people why those elements were not included, but there were no good answers. It seems no one quite knew why they weren't there or why they were there in the first place. It seems no one understood they had any importance beyond decoration. I saw the architects walking through the building, and I introduced myself. I told them I thought the building was quite wonderful but that I had a problem with the removal of the African art in the places where Barnes initially installed it. The architects nervously explained to me that the new design in the frieze below the mural was based on Kuba cloth, and that the stone patterning in the entrance hall reflecting that of kente cloth. I asked them if anybody knew that, or if there was anything in the building that would tell people that's what they were looking at. They told me there would be a brochure later. Their answers did little to calm me. Quite the reverse. I asked them if anybody picked up on their subtle reference to African textiles. Barnes’ inclusion of African art as a permanent fixture of the building was not adornment. It was not decoration. It was a unique, still controversial but very specific statement. Now it's gone. One of the architects told me that designing for the new building was like walking a tight rope because there were so many things they had to keep in mind and so many details they had to slavishly adhere to. I told them I understood, but they also understood when they took the commission that would be the case. That's no excuse. This last observation may seem petty, or too slavish to detail. I was accused of that by one of the attendees, and it’s an accusation I'm quite comfortable with. It seems to me the greatest danger always was removing Albert C. Barnes from the Barnes Foundation. The collection and his ideas are intertwined. One did not happen without the other. It's still important, because Barnes’ ideas about learning to see, about understanding aesthetics, as a way to reinforce the need for cultural equity are profound. They are lessons we still have not yet learned. I always suspected the foul denigration of Barnes, even after his death was a way to discount him as a man, to then discount his ideas as “quirky”, a word I have grown to despise. I keep milling over in my mind whether I'm being reactionary, or petty, or a bit catty which is not my intention. But I think my concerns have merit. Yesterday I received a letter from one of the former guards at the Barnes Foundation, who has been writing me ever since I moved to the West Coast. He said he is always grateful that when I led the Foundation I allowed all of the security guards to attend classes for free as long as their attendance did not interfere with work hours. The letter I received included a very poignant observation. In it, he said he was anxious about going to the downtown Barnes and that what he saw went beyond his expectations. He said based on what he had read, Dr. Barnes ideas are lost in the shuffle. "Regards for the so-called common man is lost. The Foundation will now become a paradise for the rich.” I hope he is proven wrong. Dr. Albert C Barnes and his ideas are eternal. Great art should shift your worldview. It should make you see people, events, and things in a new light. It should enhance your curiosity, ask questions and become fully engaged in the moment. The analysis of great art, of the plastic elements of light, line, color and space can and should lead to the development of critical problem solving skills. It is true that great artists sometimes make really bad art. It is also true that there are thousands of unnamed artists who make masterpieces. Knowing the difference is more important than rushing into the gallery to recognize the name that sounds familiar, to then step back and admire the painting or sculpture after having learned it was made by a “master” who is only known to be so because of name recognition. Beyond art aficionados, collectors, historians, and the other art elite, working-class people need not be treated as though they don't understand what they're looking. The Barnes Foundation was about bringing around an understanding of what makes it great, in a way that would help our broader society. Maybe I am slavish to Dr. Barnes’ ideas and his vision, but then that's why the working title of my book is, "Defending the Dead." It seems someone still has to.